Ashley Wheater, Artistic Director of The Joffrey Ballet, proudly announces a momentous 2016-17 season including a world premiere by acclaimed choreographer Alexander Ekman; Chicago premieres by Justin Peck and Yuri Possokhov, the return of Shakespeare’s Romeo & Juliet byKrzysztof Pastor and the highly-anticipated world premiere of Tony Award® winner Christopher Wheeldon’s The Nutcracker. The Joffrey Ballet kicks off its 61st season with Pastor’s critically acclaimedRomeo & Juliet, October 13-23, 2016, followed by a reimagining of the American holiday tradition, The Nutcracker, December 10-30, 2016. For its winter engagement, The Joffrey Ballet presents Game Changers, a mixed repertoire program with three pieces – the Chicago Premiere of Year of the Rabbit byJustin Peck, Fool’s Paradise by Christopher Wheeldon, and INFRA by Wayne McGregor – February 15-26, 2017. Global Visionaries, a spring mixed repertoire program, concludes the season with a world premiere by Alexander Ekman (untitled) and the Chicago premiere of The Miraculous Mandarin by Yuri Possokhov, which will receive its world premiere in collaboration with the The Cleveland Orchestra in April 2016, plus the return of Mammatus by Annabelle Lopez Ochoa, April 26-May 7, 2017. All performances take place in the Joffrey’s home venue, the historic Auditorium Theatre of Roosevelt University, in downtown Chicago at 50 East Congress Parkway. All programs throughout the season feature live music performed by the Chicago Philharmonic conducted by Scott Speck, Music Director of The Joffrey Ballet. Classically trained to the highest standards, The Joffrey Ballet expresses a unique, inclusive perspective on dance, proudly embracing the diversity of America with its company, audiences, and repertoire which includes major story ballets, reconstructions of masterpieces and contemporary works. Founded by visionary teacher Robert Joffrey in 1956, guided by celebrated choreographer Gerald Arpino from 1988 until 2007, The Joffrey Ballet continues to thrive under Artistic Director Ashley Wheater and Executive Director Greg Cameron. The Joffrey Ballet launches its 2016-2017 season with the return of Polish National Ballet Director Krzysztof Pastor’s popular Romeo & Juliet. This contemporary rendition of the classic Shakespearean tale, which mesmerized audiences at its Chicago premiere in spring 2014, is set in Italy and uses a multimedia video backdrop to depict three different political eras of the 20th century. Throughout each time period, the timeless tale of love and loss unfolds to Sergei Prokofiev’s formidably dramatic score. A ballet in three acts,Romeo & Juliet is presented in 10 performances only, October 13-23, 2016. Starting a new era for this beloved holiday classic, The Joffrey Ballet presents the world premiere of a newThe Nutcracker by Christopher Wheeldon, who won the 2015 Tony Award® for Best Choreography for the Broadway hit, An American in Paris. Set to the beloved Tchaikovsky score, its stunning choreography and visionary design will celebrate a turn-of-the-century city of Chicago as seen through a child’s eyes and will unlock an unforgettable landscape of beauty and wonder. Exciting details, including the entire creative team, will be announced this spring. The Nutcracker is presented in 27 performances, December 10-30, 2016. The Joffrey winter program, a mixed repertory program entitled Game Changers, features the Chicago Premiere of Year of the Rabbit by choreographer Justin Peck, along with the return of two popular works from the Joffrey repertoire –Wheeldon’s Fool’s Paradise and Wayne McGregor’s INFRA. INFRA, which made its U.S Premiere with The Joffrey Ballet in 2012, was created for The Royal Ballet by internationally recognized choreographer Wayne McGregor. Created after the London subway bombings of 2005, INFRA is set to an original score by Max Richter, a mix of mournful strings and calm industrial sounds, and features a 59-foot LED screen suspended above the stage displaying urban animations designed by world-renowned British artist Julian Opie. Beneath it 12 dancers execute McGregor’s bold and abstract movement to explore what’s beneath the surface of human interactions. Fool’s Paradise first captivated Joffrey audiences with its Chicago Premiere in September 2015. 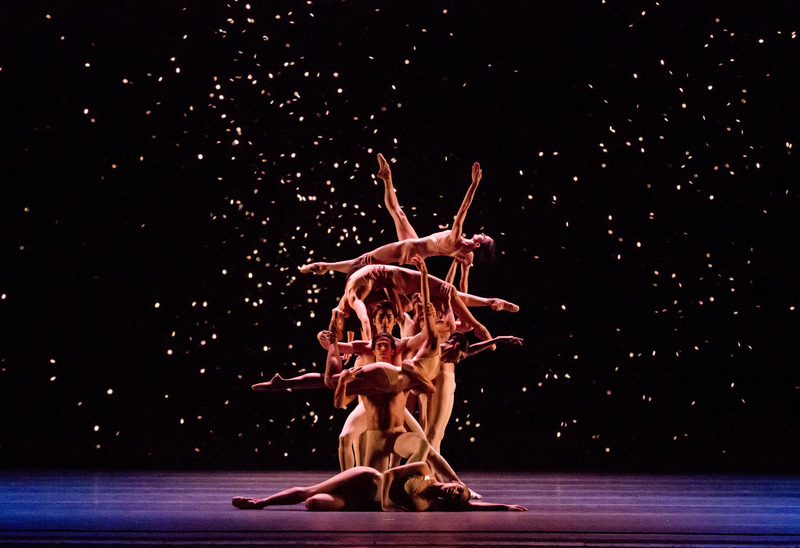 Set to a commissioned score by Joby Talbot, this abstract ballet for nine dancers moves through solos, duets and trios in a grand display of beauty and strength as the dancers’ bodies form a series of living sculptures while falling shimmering petals shower the stage. Fool’s Paradise reveals a deep connection between the dancers that leaves the audiences to discover its meaning and effect. Inspired by the Chinese zodiac, Peck’s second work for New York City Ballet, Year of the Rabbit, is a collaboration with American singer-songwriter Sufjan Stevens. Set to a classical orchestration of Stevens’ electronic song cycle Enjoy Your Rabbit, Year of the Rabbit weaves its ensemble of dancers into intricate and architectural forms with grace to produce a visually arresting work. Currently a soloist and resident choreographer with New York City Ballet, Peck, 28, has already been hailed as an important new voice in 21st-century choreography and was the subject of the documentary Ballet 422. Peck made his Joffrey Ballet choreographic debut with the Chicago premiere of In Creases in April 2015. Game Changers is presented in 10 performances only, February 15–26, 2017. The Joffrey spring program, a mixed repertory program entitled Global Visionaries, features a world premiere by Alexander Ekman, a Chicago Premiere by Yuri Possokhov, plus the return of Mammatus by Annabelle Lopez Ochoa. Celebrated around the globe for his originality and humor, Swedish choreographer Alexander Ekman brings his unique cinematic vision to the Joffrey with a new work (untitled). Ekman has collaborated with classical and contemporary companies worldwide with award winning works that both entertain and challenge the observer, including the Chicago Premieres of Ekman’s Tulle, which took Chicago by storm in 2015 along with his wild and rhythmic Episode 31 premiered on the Joffrey during the 2013 Chicago Dancing Festival. In a unique collaboration with The Cleveland Orchestra, San Francisco Ballet Resident Choreographer Yuri Possokhov creates for the Joffrey a new work, The Miraculous Mandarin, a magnificent tale of a girl forced to act as a decoy by thugs, luring a wealthy mandarin to his tragic fate. Set to Bela Bartok’s 1926 score, Possokhov reimagines this ballet specifically for The Joffrey Ballet to create a story ballet for seven dancers to explore the tragic, dark passions between men and women. The Miraculous Mandarin will have its world premiere with The Cleveland Orchestra before the work’s Chicago Premiere with The Joffrey Ballet this April. Mammatus returns to Chicago after its world premiere with The Joffrey Ballet in September 2015. This powerful, 20-minute abstract piece featuring 20 dancers in a series of ensembles and duets is set tocontemporary composer Michael Gordon’s Weather One. A minimalist stage, equipped with tree branches lit with LED lights, sets the scene for Mammatus while dancers represent surreal insects and birds through sinuous and organic movements to explore the nonlinear essence of nature and turbulent cloud formations. Dancer-turned-choreographer, Lopez Ochoa is known for her close collaborations with dancers and a fierce improvisational talent, has choreographed critically acclaimed works for numerous dance companies across the nation and around the world. Global Visionaries is presented in 10 performances only, April 26-May 7, 2017. For the second year in a row, The Joffrey Ballet will open its special, one-hour gala performance exclusively to Joffrey subscribers. Three-program subscriptions, which do not include The Nutcracker, start at $87. Subscriptions will be available for purchase as of February 18, 2016, online at joffrey.org, by mail (Joffrey Ballet Subscriptions, The Joffrey Ballet, Joffrey Tower, 10 East Randolph Street, Chicago, IL 60601), by telephone at 312-386-8905, by fax at 312-739-0119, or by email at [email protected]. Single tickets for the October, February, April and May performances will be available starting August 1, 2016. Single tickets for The Nutcracker will be available starting April 11, 2016. Single tickets are available at The Joffrey Ballet’s official Box Office located in the lobby of 10 East Randolph Street, as well as the Auditorium Theatre of Roosevelt University Box Office, by telephone at 312-386-8905, or online at joffrey.org. The Joffrey Ballet is grateful for the support of its 2016-2017 Season Sponsors: Abbott Fund, Alphawood Foundation Chicago, NIB Foundation, and the Daniel and Pamella DeVos Foundation, and to its 2016-2017 Season Partners: pamella roland and Fox Ford Lincoln; Official Provider of Physical Therapy, Athletico; Official Health Club, Chicago Athletic Clubs; and Official Hotel, JW Marriott. For more information on The Joffrey Ballet and its programs please visit joffrey.org. Podcast With Ashely C. Wheater from Michael Roberts on Vimeo.